It’s Chinatown remade with anthropomorphic desert creatures. It’s a Western by way of Hunter S. Thompson. It’s a loving parody of cinema’s wide canvas. It’s one of the most wild, anarchic, oddball animated films to ever be released by a major studio, and it is stupendous. 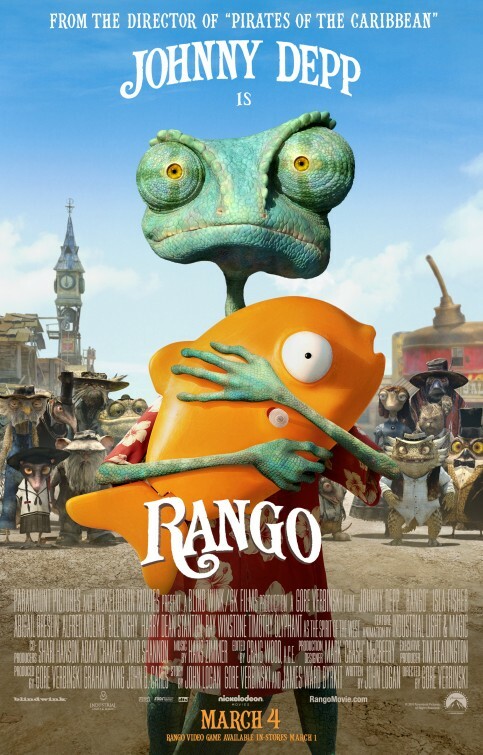 Steeped in weirdness and bravado, Rango has a playful and occasionally macabre sense of humor that kept me in stitches. Director Gore Verbinski (the Pirates of the Caribbean flicks) translates his visual verve into a animated movie that dazzles the eyes with its magnificently drawn features as well as the pointed personality in every stroke. This is a movie with character, not to mention some pretty entertaining characters (including talking road kill). Johnny Depp delivers an idiosyncratic vocal performance for a household lizard that finds himself pretending to play sheriff for a town in need of a hero. When you think Rango will fade into familiar territory, or easy moral messages, the film keeps surprising, forging its own unique path. This is a lively, peculiar, and overall enchanting animated film that’s suitable for families but may well play better for adults with eccentric tastes. I’m still scratching my head, and celebrating, how something like this slipped through the system.